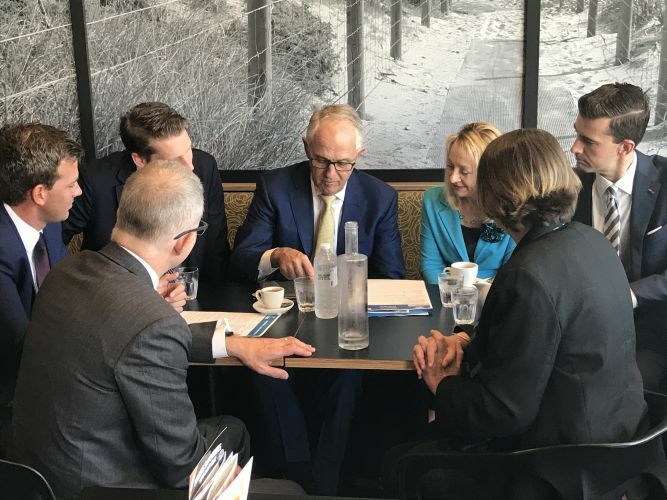 Prime Minister Malcolm Turnbull was in Lakelands this morning. THE Lakelands train station is one step closer to becoming reality, with $2 million funding committed by the Federal Government to develop a business case for the key project in northern Mandurah. Funding to construct the station has also been earmarked in the Federal Budget, a clear sign of the Government’s commitment to building better infrastructure in Mandurah. Canning MHR Andrew Hastie, who has campaigned for more than 12 months for Lakelands train station, welcomed the announcement, saying the community’s voice was again being heard in Canberra. “The people of Lakelands have been waiting years for this project to happen,’’ he said. “We’ve been campaigning hard to get it off the ground so today is a very special day. “This announcement is a vindication of our efforts. “In 2006, the population of Lakelands was 434. “By 2016, the number had exploded by more than 10 times to 4830. “If you include the immediate surrounding suburbs of Mandurah, that number rises to 17,298. “Mandurah needs infrastructure that will relieve congestion, improve road safety, grow the local economy and expand access to jobs in Perth. “The Lakelands train station will help do just that. “The only train station in Mandurah was completed 10 years ago. The project forms part of a $3.2 billion funding package of new infrastructure in WA, announced today by the Federal Government of which more than $500 million will be spent in the Peel region. As well as the Lakelands station, the Federal Government has also committed more than $800 million to expanding the Tonkin Highway, connecting it to South Western Highway after Mundijong Road and $214 million to extend the Armadale rail line to Byford.